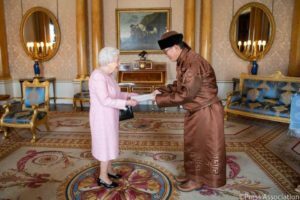 Extraordinary and Plenipotentiary Ambassador N.Tulga has presented his Letter of Credence to Her Majesty Elizabeth II, The Queen of the United Kingdom and the other Commonwealth realms, at the Buckingham palace on 14 November 2018. Ambassador N.Tulga has expressed his commitments to further strengthen and develop the bilateral friendly ties between Mongolia and the United Kingdom of Great Britain and Northern Ireland. Upon receiving the Letter of Credence, The Queen has congratulated the Ambassador for his second appointment and while wished him a success in his endeavours, she has expressed her satisfaction toward the enhancements of the bilateral relations.